Famitsu had the chance to interview Series Director Tetsuya Nomura about the events of MAGIC 2017, an anime and video game convention that took place in Monaco on February 18. Nomura, who was invited to speak about his career, brought along 2 screenshots showcasing his current projects; 1 each of KINGDOM HEARTS 3 and FINAL FANTASY VII Remake. 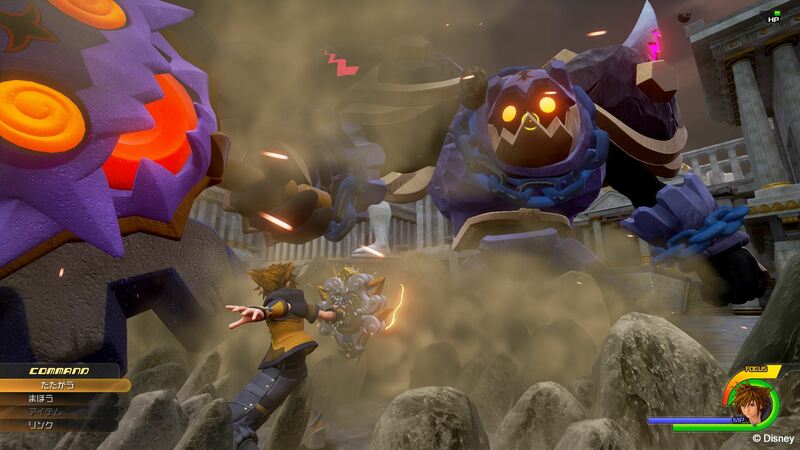 In the interview, translated by Gematsu, Nomura explains the KINGDOM HEARTS III screenshot depicts a battle in the city of Thebes against a massive Heartless known as the "Rock Troll", which serves as Olympus's mid-boss. Sora will be able to transform his Keyblade into two variations, and what forms they can take will depend on the Keyblade. There will not always be a variation for attack and defense, such as the case with the crossbow and bazooka that appeared in the E3 2015 trailer, and the shield and tank shown off here. As for the Link command set at the bottom of the battle menu, more information will be released in the future. This screen still hypes me so damn much. Awesome! More info on how Keyblade Transformations are going to work! I guess this means we're really going to have to be more strategic when choosing a Keyblade to equip rather than just equipping the one with the best stats like in most KH games so far. And it's really great to see that we're getting Drive Forms/Keyblade Transformations so early in the game. This image is only halfway through the first world and we already have it. I'm so excited for mid-bosses, not even kidding. There now we can put "transformations are tied to drive forms" to rest. They were just doing what we did in KH2, equipping the keyblade whose abilities best suit the drive form they are in. So you're not always going to have a shield in guard form unless you have a keyblade that transforms into a shield equipped. Maybe it has the same function as wayfinder in Bbs? I think at this point we can really start to understand how massive this game is going to be. We know KH3 is going to have more worlds than KH2. From all the information we have about Olympus Coliseum like mid bosses and the huge world areas we've seen so far, each world seems like it going to have around 3 hours of gameplay! I can imagine KH3 being up to 50 hours long! That's exciting. Let me know if you think I may be wrong or overestimating it. And aren't we still supposed to get some KH3 news soon? Does anyone know what's going on with that? I thought it was coming in the winter but winter is nearly over. This is my 358th post. Got it memorized? I want to hope for the same but I think there might also be smaller worlds and not only big ones. It also may look big but maybe traveling through some areas won't take as long as it seems. And. I. Am. So. Excited. For. This. I. Could. Die. GAH! Hopefully what Nomura said means we'll be getting more news soon. [strike]Like another picture for the anniversary this month? [/strike] I want to know what the Link stuff is even MORE now. I feel like Hirokey's right, and that it's Dream Eaters. Also hyped about how big this game is going to be (and that we now know this Heartless' name). But mid-bosses? Oh boy! Glad to have a better idea about Keyblade transformations now. Choosing them is going to be really strategic in this game and I love it. It's one of the things I actually like about Unchained Key, too. It's going to be a huge game yes, hopefully not too huge. But overall I am excited that there's going to be a lot to explore, which hopefully means sidequests! I live for sidequests. There haven't been enough of them in KH, I want more. That would be a good way to balance it, that you could speedrun it through in a reasonable time, but also sink tons of hours into getting 100% if you want. This right here. I am so excited about the idea of being more strategic with the keyblades. The fact that each key chain is no longer just cosmetic with a +/- strength/magic? Mind blowing. Did not expect this at all early on in KH3's announcement. I also love the idea of how different each world's key chain will be. Maybe the Big Hero Six key chain will temporarily spawn microbots to fight for you. I'm more curious now if you can still use drive forms with non matching keyblades. Like trying to use any other keyblade, besides the Coliseum, and try to use Guard form. The question that keeps running in my head is, will Keyblade transformations really be that different from each other? Will there be plenty of transformations that do unique things, or will there be like 5 and as we get new Keyblades, we'll get better versions of those transformations? I wonder about this as well. I just kinda don't see them give us like 10 or more different transformations, but rather just a few. Maybe the Big Hero Six key chain will temporarily spawn microbots to fight for you. Mid-bosses isn't that big of a deal: KH2 OC had Hades escape, Cerberus, Demyx mini-game, Pete, & Pete again before getting to Hydra as the endboss of the 1st visit. Somehow I misread "Pot Centipede" as Plot Centipede for a moment here and thought Launchpad has launched another pad...err pun at KH's overall plot in stealth mode. am I really that bad????? Wow, this is sort of revealing. Mid-game bosses happened quite a bit in the series prior, it doesn't really surprise me. Although it's weird that this thing isn't some sort of "titan". Oh well, I guess Rock Troll makes sense. Nah, it was probably my lack of sleep that made me read things wrong. And in all honesty, when it comes to lackluster presentation of the story and Nomura packing too many twists and not enough coherency in it I actually agree with you on several parts despite being a "lore geek" and mainly positive about it. Although it's weird that this thing isn't some sort of "titan". Oh well, I guess Rock Troll makes sense. Since it is a troll, it is probably sent by either Braig or Young Xehanort aka Trollanort. Eh he he, oh wait, right, this whole stuff takes place in Olympus...and who else is a troll that actually lives in Olympus?